Pioneered in the 1970s, the genre of hip hop has gone onto dominate pop culture. A musical style originating from the Bronx, the form was built on the foundations of 5 particular elements which are MCing, DJing, Grafitti, Knowledge and lastly breakdance. 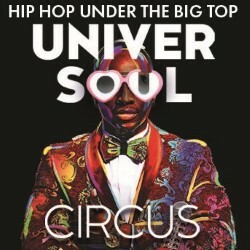 Amazing audiences in the US for 25 years, Cedric Walker‘s UniverSoul Circus celebrates hip hop culture with their latest line up of circus acts originating from Africa and the Caribbean. Guided through the afternoon’s showing by ringmaster Lucky Malatsi, he starts the carnival-esque procession as artists showcase exactly why they’ve made this year’s line up. From Caribbean Dynasty‘s (Trinidad and Tobago) quite literally fiery take on the limbo, The Willie Family‘s (Colombia) fearless ability to effortlessly not only balance on top of a high wire, but to also lift one another is jaw dropping, to Duo Amour‘s (Cuba) beautiful partner work on the silks, UniverSoul effortlessly sustain the party going vibe, thanks also to the vibrant mix of hip hop numbers. The Bone Breakers from Guinea stun with their jaw dropping abilty to contort their bodies in ways you didn’t at all think possible. Troupe Nomuna showcasing what it means to be a team, supporting one another as they back flip off a Mongolian teeterboard in quick succession, and lift one another to create pillars of strength. Awe inspiring feats that give the show its care free yet ambitious edge. Malatsi continues to ease the flow of the afternoon by of course encouraging the audience to get involved. Whether that be teaching us a short hip hop dance routine or throwing beach balls in the crowd to be thrown about the space, the he reminds us that this is an hour to let go of any external worries; this being exactly what you’d want from a circus show. Fresh the Clownsss – a trio of hip hop clowns further engage the audience with their humourous timing, encouraging randomly selected members to mime to soul classics. This is a fun interpretation of the clown role.